Lotus Notes 7.0 Training Course is designed to teach the basic features of the Notes client and compose and send e-mail. identify the main features of the Notes client and navigate the Notes 7 interface. perform basic tasks within a Notes database. use the appropriate Help feature in given scenarios. perform basic tasks within Lotus Notes 7 in given scenarios. recognize how to create and send e-mails in given scenarios. manage mail in given scenarios. send mail and respond to incoming mail in given scenarios. select mail preferences and create stationery in given scenarios. use rules to filter mail and create an automatic out-of-office reply for incoming mail. manage incoming mail, configure mail preferences, and compose and send a memo in a given scenario. recognize how to log on and participate in Instant Messaging and how to manage your online status. use Instant Messaging to communicate with online users in given scenarios. add contacts and groups to the PAB. 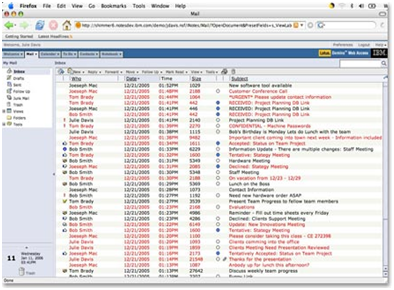 manage contacts and groups in Lotus Notes 7.
add contacts and groups to the Instant Messaging Contact List in given scenarios. save mail and Instant Messaging contacts in given scenarios. recognize the features of a Notes database and create a database in a given scenario. create a TeamRoom database in a given scenario. recognize how to format and edit documents in given scenarios. create a database and format a database document in a given scenario. recognize how to use the Calendar effectively and how to set reminders in given scenarios. recognize how to use the Calendar tools to coordinate and plan group meetings. use the Calendar to schedule and respond to meeting invitations in given scenarios. create personal and group To Do and Personal Journal entries. recognize how to configure the Notes client for remote access in given scenarios. create and manage replicas in given scenarios. access Lotus Notes mail from a remote location in a given scenario. access and manage mail with Domino Web Access (DWA). open and synchronize the mail database with Domino Web Access (DWA).